Thank you for coming in and joining us for our final fort in “The Forts of Oklahoma Series.” This fort tends to hit a little closer to home, as it is the only fort that is still an active military installation to this day. The original military occupation of the site is listed as being in 1834, when the 1st US Dragoons established “Camp Comanche” to begin negotiations with local indigenous tribes. In 1852, Captain Marcy arrived to explore the Indian Territory and made the recommendation that the site be considered for a permanent fort. In 1858, Colonel Douglas Cooper also made the same recommendation. The fort was initially staked out by Major General Philip Sheridan and Colonel George Custer on January 8th 1869. First named Camp Wichita, it was known among the indigenous tribesmen as “The soldier house at Medicine Bluffs.” The installation was later renamed by General Sheridan in honor of his friend Brigadier General Joshua Sill, who was killed during the battle of Stones River, Tennessee, in 1862. The site was staked out as support for the tribal pacification policies enacted by President U.S. Grant in response to increasing raids and massacres just after the War Between the States. The Indian Territory was quite lawless, particularly after the War Between The States. The only law in the territory was enforced by the U.S. Army including soldiers from the other forts in the Oklahoma/Indian Territory. The policy of pacification was carried out by numerous Indian Agencies that were assigned to different forts throughout the territory, indeed throughout the entirety of the Great Plains. Some of the more notable visitors to the location were Jefferson Davis, General Henry Leavenworth, Nathan Boone, Wild Bill Hickok, Buffalo Bill Cody, Ben Clark, and Jack Stilwell. After several months in operation, President U.S. Grant approved agents from the Quaker Indian Agency to be assigned to the Kiowa and Comanche tribes on their reservations just outside of Fort Sill. The army was prevented from taking punitive actions against the indigenous tribesmen who used Fort Sill as a sanctuary. This resulted in the Warren Wagon Train Raid. The chiefs: Satank, Satanta, and Addo-Etta (Big Tree) were arrested and ordered to be transported to Texas for trial. A mile from the fort, Satank grabbed the carbine of one of the troopers guarding him, and before he could fire it, was hit by several bullets from the other guards. Satank’s body was left leaning against a tree, and the column continued on its mission to deliver the other two chiefs to Fort Richardson, Texas. A marker commemorates the site where Satank fell. He was buried in “Chiefs Knoll” in the Fort Sill Post Cemetery. Satanta and Addo-Etta were tried and convicted for instigating the raid and sentenced to death by hanging. Their sentences were commuted to life in prison by Texas Governor Edmund Davis. In October, 1873, they were paroled. In 1874, the Comanche, Kiowa, and Southern Cheyenne engaged in the “Red River War,” which lasted almost a full year. The last chief to surrender was Quanah Parker. His surrender signaled an end to the indigenous tribesmen involvement in the warfare in the southern plains. At one point during the 1880s, the fort was nearly deserted when a rumor had been spread that gold was found in the Wichita Mountains nearby, as both the enlisted men and the officers left to stake their claims. During the 1880’s and 1890’s, one of the units that was stationed at the fort was Troop L of the 7th Cavalry. This troop, consisting entirely of indigenous tribesman, was considered to be one of the best in The West. Several of their members are credited with helping the tribes avert the bloody “Ghost Dance Uprising” in which many tribesmen were brutally killed by the Army. In 1894, the fort received the Chiricahua Apache chiefs as prisoners of war. The most notable name among them was Geronimo. After having been at the fort for some time, the government allowed him to travel with Pawnee Bill’s Wild West show. Geronimo, with a contingent of Apache, was allowed to attend several annual World Expos and Indian Expos during the 1890’s. They were even able to ride in Theodore Roosevelt’s inaugural parade. Geronimo died of pneumonia, as a prisoner of war in 1909. Being on the fringes of the Indian Territory, Fort Sill had started to lose significance during the later 1880’s throughout the 1890’s, even into the earlier part of the 20th century. 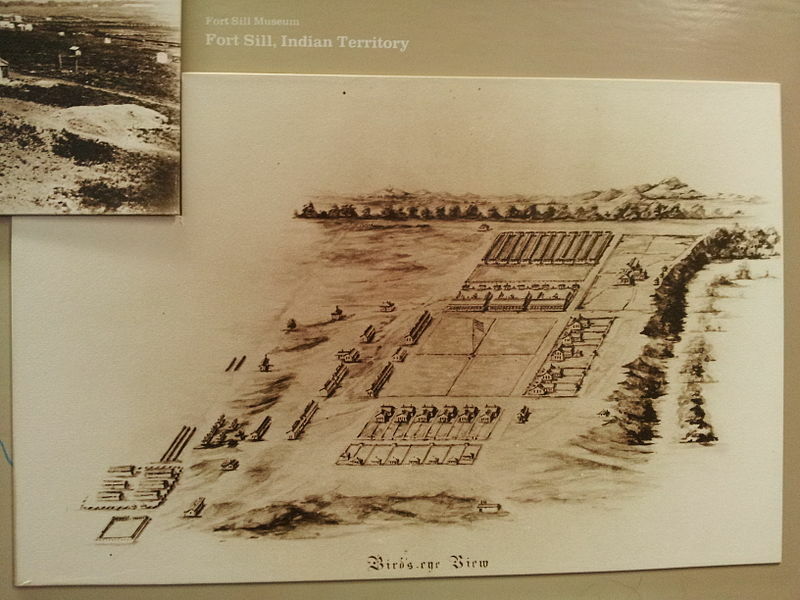 In 1901, the last of the indigenous tribes’ lands to be opened to white settlement was located around Fort Sill. The town of Lawton quickly sprang up, becoming one of the larger cities in the new State of Oklahoma. The first artillery battery arrived in 1902, and the last cavalry regiment departed in 1907, the year Oklahoma became a state. This marked the historic change in roles from being a little-known frontier cavalry fort to an enduring role as a major artillery fort in the US Army. Thanks, Connie! Hope you come back for the finale on the forts. That is an idea, Vickie! That would also give us the opportunity to put back what we couldn't fit in. lol. So glad you've enjoyed them!